The jig to set the dropouts on the chainstays arrived just before we departed for our summer vacation. It's a simple tool. You bolt one side up and gently persuade the other side to line up. Then you reverse the process and keep going until the dropouts are both parallel. Note the large penny washers to spread the load over the whole of the dropout. 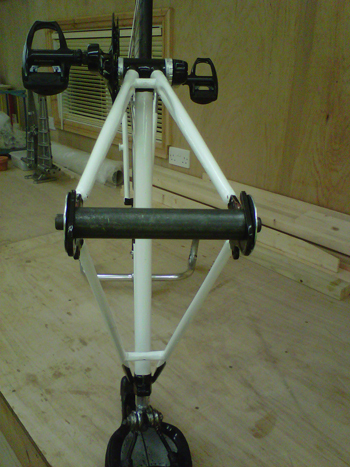 I left the fixture bolted in place for a couple of days before fitting the rear wheel / hub gear assembly. It slotted straight in and lined up perfectly. I've chosen to run the shift cable up the rear leg of the frame, as it gives a direct cable run to the shifter. This layout also worked with the supplied anti-rotation washers which is a bonus. So I've had to mount the shifter on the stem which is 19mm. Awkward to use but until the integrated brake / shifter arrives it'll have to do.